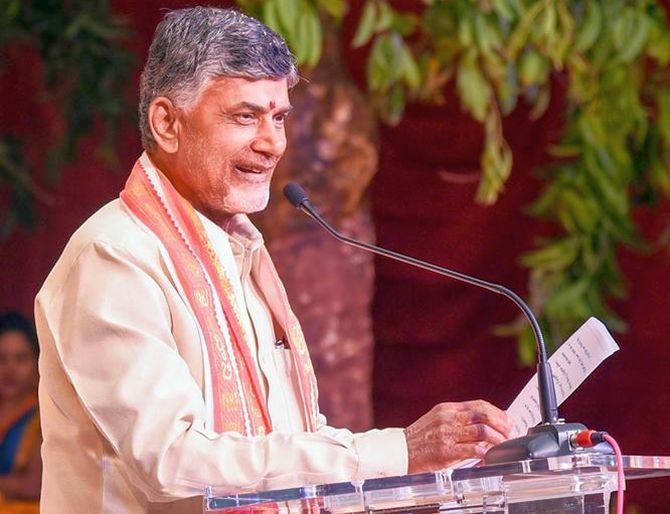 After snapping his political alliance with the ruling National Democratic Alliance at the Centre, N Chandrababu Naidu, chief minister of Andhra Pradesh, speaks to B Dasarath Reddy on what he now has in mind. Having won the elections after a gap of 10 years in 2014, you were often quoted as saying welfare programmes were as important, if not more, as development and economic reforms to stay in power. Will it apply to the next elections? Continuous hand-holding of people at the lower rungs of society is essential for inclusive growth in a country like India, which has all kinds of inequalities in terms of caste, region, education, between drylands and irrigated lands, and so forth. Earlier, I thought the fruits of development will reach everyone by a trickle-down effect. I was wrong. These inequalities will have to be addressed and balanced through active interventions to empower every person. There were many reasons why I lost the election (as incumbent CM) in 2004. One reason is that I did not do proper balancing of welfare, development and reform goals. Because I lost the elections in 2004 and again in 2009, it had derailed the pace of development of the state; the eco-system I created in Hyderabad (capital of pre-partitioned Andhra) continued to grow to a certain extent. But, those 10 years were a lost opportunity for undivided Andhra. It would have become the country’s number one state if the steps taken in my (1995-2004) tenure were taken forward at the same speed. After the state’s bifurcation I had to start this all over again. AP is now the lowest in per capita income in South India, despite registering the highest (annual) growth rate of 10.5 per cent for the past four years. It will take some more time to achieve urbanisation, growth in the services sector and industrialisation. Welfare programmes are an essential component of inclusive growth. My struggle and my efforts have to benefit everybody and every nook and corner of the state on a continuous basis. Not a single major welfare programme ever introduced in the state by successive governments after the 1980s was discontinued by any party, even after the state’s bifurcation. This will only encourage the common voter to look for a change in government to get more sops, just as the way the opposition YSR Congress is now promising an unemployment allowance of Rs 3,000 a month to graduates as compared to the Rs 2,000 allowance announced by your government, some say. I believe the common man is a very intelligent person and knows whom to trust. He knows their background. What is their (state opposition parties) experience? Their track record? It is zero. How can people trust these promises? Even look at the promises made by Prime Minister Narendra Modi. He promised four years ago that he would bring back all black (undisclosed) money from abroad and give Rs 3 lakh to each person in the country. He could not do it. Not that it is an easy thing to do, but one should have a vision and experience to make things happen. So, people will take a right call on such promises. Brand Naidu has always been associated with development. 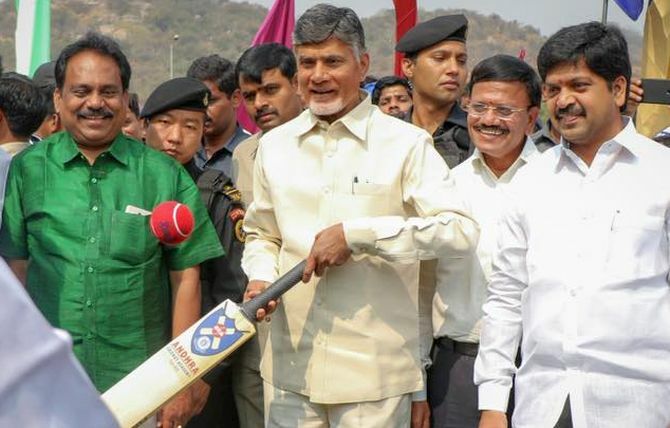 Owing to their sheer size and other reasons, none of the major infrastructure projects, including the new state capital of Amaravati, is expected to be ready before the next election. What would you say if the opposition interprets this as your failure on the development front? To construct a house takes two to three years. To construct a capital, with all the master planning, land acquisition, etc, obviously takes much longer. People do understand this. I cannot construct only a secretariat and say the capital city is ready. Soon, the administrative capital will also be ready and there will be a new airport. When I shifted to Vijayawada (interim capital, after Hyderabad went to Telangana), there used to be only one daily flight to this city. I developed the existing airport and now the air traffic has increased manifold. We are facing hurdles for a new airport as the Government of India was not cooperating. People gave me land and I got the master plan ready and started promoting this place for investment and institutions. We already have some of the best institutions, best hospitals and best hotels up and running here. It took nine years, from 1995 to 2004, for me to build the eco-system in Hyderabad after I visualised and planned for the Outer Ring Road, the new international airport and other things. Tell me if there is one city in India that matches with this kind of development. Prime Minister Modi developed Gujarat. You can compare Ahmedabad with Hyderabad to find the difference. Take any Indian politician who is in power for 20, 30 or 40 long years to see if he has developed a city on the lines of Hyderabad anywhere in the country. There is none. I have got a vision to accomplish such a development. It will take some time due to logistics and other issues but people are already responding, as they believe in my vision. During my early years as CM of undivided AP, I brought Microsoft to Hyderabad with great effort. The Microsoft campus became a flagship company for the city that attracted the attention of all the other global information technology giants. Similarly with Korean company Kia Motors, which was exploring Maharashtra and Tamil Nadu a year ago. I wanted Kia to come to AP. They liked a location close to Bangalore, in (Andhra’s) Anantapur district, and asked us to show water and other infrastructure there. When I brought water to that place within six months, Kia then decided on its $2-billion (Rs 135 billion) investment in Anantapur. With the upcoming operations of Kia, Ashok Leyland, Apollo Tyres and Hero MotoCorp, an automobile eco-system is slowly evolving in the state. Currently, 25 per cent of mobile phones manufactured in the country are made here in Andhra Pradesh. I want to take it to 50-75 per cent of the country’s total production, to make the state a hardware hub. Are you satisfied with the pace of development? A hundred per cent. I have done two things. One, I brought convergence among all departments. Two, I have used technology to bring a shift in governance and gave a vision to perform. With this, the people in administration and on the field are working in a self-driven manner. Most of my (earlier) team members stayed back in Hyderabad because it is a developed city. Those who are natives of AP or with no other option came with me. But, these very people are now becoming the number one team in the country by any measure. How are you planning to develop Amaravati? This area is a hotbed of entrepreneurs. People from this region have migrated and settled all over the world, in pursuit of opportunities. Now, it is a fresh destination for them to return. Therefore, I am spending Rs 500 billion on infrastructure. We mobilised 33,000 acres through a land pooling scheme, while we are borrowing funds for the development of infrastructure. I am going to offload some of the land to repay these loans when land prices go up. The government will also generate resources in the form of taxes. Today, Rs 240 billion worth of projects are in progress in the Amaravati area. We have started work on some iconic structures. We are developing trunk infrastructure with all utilities concealed in ducts, a first-of-its-kind in India. Six to eight towers with around 4,000 houses for administrative staff will be ready by December-January. Five more towers of the administrative capital, including the assembly and high court, will be in construction by around that time. Singapore companies have also started work on the start-up area given to them. You had a word with Prime Minister Modi on the sidelines of a recent NITI Ayog meeting in Delhi, the first time after you parted ways with the NDA in March. Have you got any assurances? I raised all the issues related to the state’s bifurcation. We are part and parcel of this country. We are also paying taxes. When there was a specific commitment given by the Centre and also agreed to by all political parties on extending a set of special benefits and projects to the truncated AP, it is the Centre’s responsibility to fulfil those promises. We will keep bringing pressure on the Centre to achieve all our demands, including special category status for the state. Bharatiya Janata Party leaders said you pulled out of the NDA alliance for selfish reasons. I joined the BJP-led NDA expecting their help for my state. That they did not do. Then, why should I support them? The PM is not willing to implement even those things that were promised to the state. They may now say many things but I am not going to surrender. The measure of greatness of a leader is his performance. Just as the PM has to do something for the nation, I have to do something for my state. They talk about corruption when I differed with them. How many banks were closed and how much corruption has taken place during your tenure? What happened to your earlier promises on corruption? In my state, I am fighting corruption. What have you done? Give me one instance. Don’t underestimate (my) Telugu Desam Party, which played a historic role in national politics. We were the only regional party which played a role in national politics way back in 1984, when the BJP had only two seats while we had 35 in the Lok Sabha. Karnataka’s recent election, more particularly the post-poll alliance between the Janata Dal-Secular and Congress, and subsequent by-elections in various states, set a tone for opposition unity ahead of the next elections. What would be the single most rallying point that can sustain such unity? NDA has misused its mandate. They are not bothered about people’s problems. All slogans. No action, no achievement. If there is a vision, one is expected to set a road map to make it happen. What is the road map and what is the achievement of Swachh Bharat, Skill India, Jan-Dhan, Make in India and similar other programmes? They have to tell which of their programmes has achieved success. We accomplished 100 per cent sanitation in the state, as I have spent Rs 11,000 for an urban toilet when the Centre gave only Rs 4,000 per toilet. I spent Rs 7,300 on a village toilet when they gave us only Rs 3,200. On top of it, they have not been able to handle the economy properly. India is blessed with demographic divided, technology strength, a large market and English speaking population. With a proper vision, plan and execution, we can unleash the potential of these advantages to fuel economic growth. That is also not happening. There is talk that the Centre is planning early elections. Do early elections change outcomes? Early elections are not new to this country but never had it helped anybody. I advanced our elections in 2004. Then Prime Minister Vajpayee did the same. Karnataka Chief Minister S M Krishna brought forward the elections. Odisha Chief Minister Naveen Patnaik also advanced his elections by taking a cue from me. It won’t make any difference when people have decided to vote against you. You will only lose that last six months in addition to the elections. Do you think like-minded regional parties will come together to form a front before elections? You seemed to suggest that only post-poll alliances were going to happen at the national level this time. I am not saying anything on whether things will go this way or that way. In Karnataka, there was a post-poll understanding. In the by-elections in a couple of places, political parties had come together to fight. We have to wait and watch. In Indian history, different types of political polarisations and different types of coalitions had emerged at different points of time. First in 1968, then during the Janata experiment under Jayaprakash Narayan, and then the V P Singh government…you had anti-Congress regimes. Then came the United Front, supported by the Congress party. Then NDA came against Congress and later the United Progressive Alliance was formed against BJP and vice versa. Some of these coalitions were formed before the elections and some of these happened after polls. Now, there is political polarisation. It is happening because the present leadership is unable to handle this great nation properly. Look at what happened in Kashmir. You are not giving anything to people. After a hard day’s work, one has to go in search of cash at ATM after ATM. There is a lot of anger. People have lost trust in banks, as you are not taking any action on Nirav Modi and others. I had to call Reserve Bank officials once in 10 days, asking them to send some money to the agency areas for payment of wages to tribals. Payment of social security pensions was a problem. The Goods and Services Tax is another problem. Farmers are not happy. Unemployment is growing. Fuel prices rose to the highest ever levels. These are all problems which are not acceptable to the common man. Is a point of convergence possible among regional parties on building an alternative to the BJP, with or without the Congress? Political parties in different states are fighting with different political opponents. Today in AP, there is neither Congress nor BJP. It is the same case in Tamil Nadu. In Telangana, the ruling party is fighting with the Congress. Karnataka’s political scene is dominated by two national parties, and so on and so forth. So, different people perceive the political realities differently and they will align differently due to personal compulsions. There is no clear way but, ultimately, people are angry with the government and parties will have to take a call accordingly. Prior to March 2018, you were facing only one political opponent in the state, the YSR Congress Party. Today, you have two more political adversaries in the form of the BJP and Janasena president and popular Tollywood actor Pawan Kalyan. 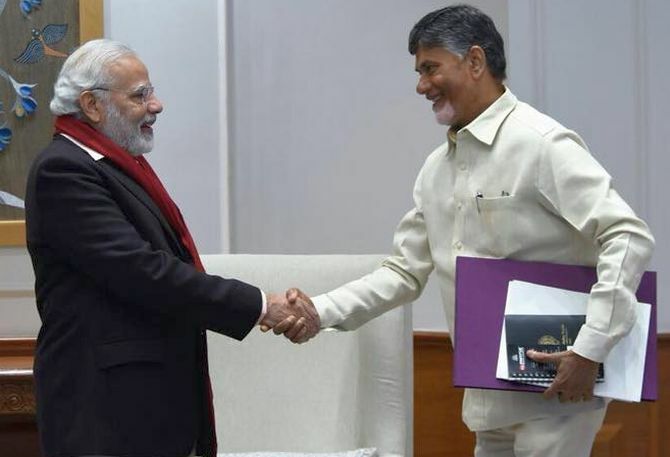 Would it affect the TDP’s prospects? Add the names of the Communists and the Congress to the list. There are so many parties everywhere and AP is no exception. But, there is nothing to worry about. If you perform, people will vote for you. If you won’t perform, people will not give you another chance. Performance and delivery matter to them. What I have done for the past four years across the nooks and corners of the state have made people realise how I have done everything with utmost efficiency. What are the two-three factors that you believe would help your party win the next elections? My performance, my welfare programme and the way I handled all issues concerning the state. Living standards of people in the state have improved tremendously in the past four years. People are happy. I have to give a helping hand to those at the bottom. That is the purpose of my welfare programme. I have reduced the expenditures of households and increased their income levels at the same time. All these elements have brought financial stability and better living standards for the common man. I am monitoring employment generation activity very closely. This year, we are spending huge money. Rs 200 per day for 100 days guaranteed. Then, I am providing other employment, beside 25 kg rice at Re 1 a kg. I am providing social security pensions. I am giving marriage assistance, 75 units of power to SC/ST households, student scholarships and improved standards at social welfare hostels for boys and girls. In healthcare, many interventions are available to people, starting with free dialysis for kidney patients, free lab tests, free hospital medicines and a health cover of Rs 2.5 lakh for each family, with free treatment coverage for around 1,250 diseases. I am also giving quality education for poor children and many more. What role would you see for yourself in national politics? You said your party was going to play a significant role in formation of the next government at the Centre. I have my own demands to pursue, as the state has lost everything. India is a great nation, which would show me the way. Let us see how things pan out in the coming days.